Thanks to this session we will have the chance to present a project idea focused on improving mobility for the elderly. Its name is “Accessible Transport: an assistant to help elderlies’ mobility by using speech”, and it seeks to promote accessible transport for the elderly. By using an intelligent voice technology system, it will help them to move about very easily, with an extensive network of drivers specifically trained for care. The aim is to find European partners to work on this proposal and to present it at the call for proposals that the AAL Programme launches on that day. At the same time, we also had the chance to share impressions and news about our own projects, as in the case of Kwido and Mementia. And to increase the visibility of other international projects in which we participate, such as zocaalo, PETAL, IOANNA and DAPAS. 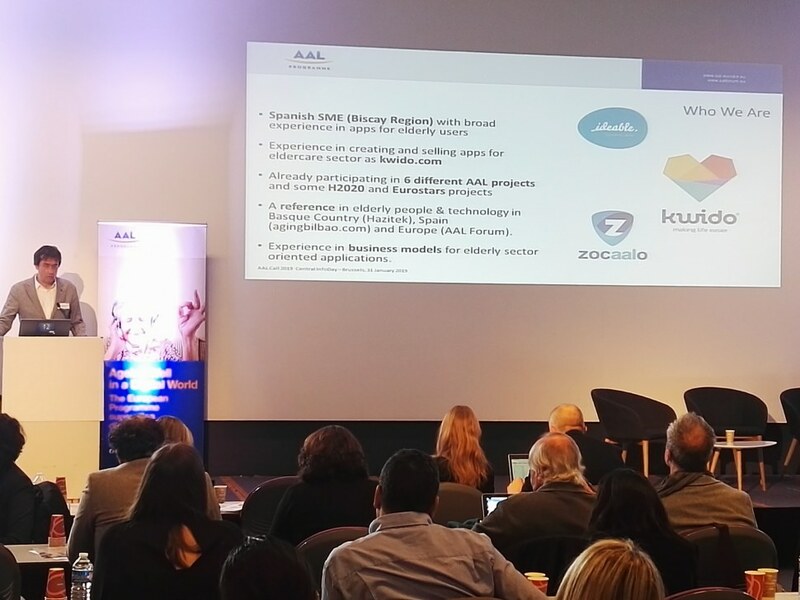 At Ideable Solutions, we would like to thank the AAL Programme for the invitation to participate in this AAL Info Day 2019, and for giving us the opportunity to continue innovating and proposing improvements for the quality of life of our elders. AAL PROGRAMME is a European funding programme that seeks to improve the quality of life in older age. To do this it encourages the creation of alliances between technology companies whose projects are geared towards active and healthy ageing. Since 2008 they have financed a total of 220 projects that promote different aspects such as mobility, social inclusion, accessibility for online platforms, etc. Do you need technological support in the digital transformation processes linked to health and elderly care? We are specialists.